Knowing Flash is knowing how to make optimal use of your toolbars. The most important of which is the drawing toolbar. This toolbar is located on your extreme left and will look somewhat similar to what you see in the figure. 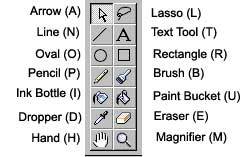 It has options like line, oval, brush, eraser, etc along with their various modifiers. The letter in brackets is the shortcut key for each tool. Using the shortcut keys instead of using your mouse will help do things in a faster way. Magnet - Toggles the Snap Feature (It has the ability to 'snap' objects to a grid or other objects). Smooth/Straighten - Simplifies selected lines or shapes. Scale/Resize Tool - Displays handles around object for scaling. Rotate - Displays handles around object for rotating it according to needs. Magic Wand - It can be used for selecting particular parts of an image. Polygon Mode - It is used for drawing polygons. Pressing " Shift " will enable you to draw a perfect circle. Pressing " Shift " will enable you to draw a perfect squares. Paint filled shape (paint normal/ paints fills/ paint behind/ paint selection/ paint inside). Gap size - It controls how large gaps can be before they are not recognized as one fill shape. Lock Fill - It can 'attach' one fill to another, and appear to be part of one shape. Transform Fill - Ii has the ability to rotate, screw, and scale fills. Picks up a fill or line style when you click on a shape or line. It has no modifiers. Eraser Mode - It control what can be erased -- normal, erase fills, erase lines, erase selected fills, erase inside. Faucet - It erases entire lines or fills. When the Stage is magnified, you may not be able to see all of it. The hand tool lets you move the Stage so that the view changes without making you change the magnification. It gives you the ability to enlarge or reduce the view of the movie. If you drag a rectangle around a certain area it will zoom in to that specific area. Using the Alt key will allow you to toggle between Zoom in and Zoom out modes.